' What daughter doesn't need advice? What mother can't give it? Whether she's 18 or 81 a daughter can always benefit from a second opinion on the condition of her soul, her heart, her head, her hair, her cleavage. Also her loves, her hates, her dreams, her debts, her teeth and sexting. No second opinion will be more valuable that her mother's because it will be offered with love tempered by wisdom and in the certain knowledge that without it this daughter will end her days on the streets, in the gutter, with spoilt children, gum diseas and bosom droop. 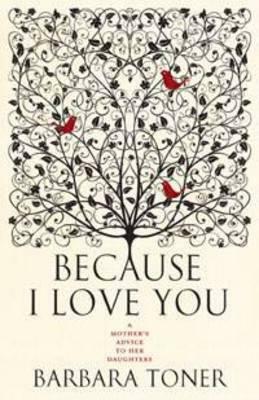 Because I love you is a beautifully presented hard covered book that has a feminine gentle look about it that is modern, stylish and sleek. From the shelf it will draw your attention, calling you to open its cover and absorb its words, but that is where it started and ended for me. It is not very often I am drawn to a book by its cover alone. Usually the title will engross me and the back blurb with keep my interest intact, leading to a love of the book from beginning to end, but with Because I Love You by Barbara Toner I was lost at the first page. As a mother of two daughters I will admit that the title is catchy and the back blurb is enticing, what mother doesn't want to hand a bit of wisdom and advice to their daughter, but I am sorry Barbara I couldn't quiet work out what you were getting at with this book or even the reason it was published. From the first paragraph I was scratching my head trying to work out whether Barbara Toner was being serious or trying to write a book of humour. I was tempted by page 5 to put the book down and declare I could not read it but continued to the end seeking the answer to my questions of who would read this book? What is the book trying to portray? And Why publish this book? Don't get me wrong Barbara Toner can write. Her words flow beautifully and the overall content makes sense but I found the advice she gave to be condescending and belittling toward her daughters at times. I soon realised that this was Barbara's dry sense of humour. I did laugh a couple of times and I did agree with Barbara a couple of times in jest but this book is not something I would give to my daughters in order to give them advice. Not sure whether Because I Love You is meant to be read by the mother's or given to the daughters. It mentions that this book is a heartfelt address by Barbara to her three daughters. Maybe one needs to know Barbara and her daughters to fully understand it. When logging the book into Goodreads.com and giving it three stars I noticed that everyone else who had read it had given it three stars or less as well. Because I Love You by Barbara Toner is sure to open itself to a bit of conversation as readers discuss how they felt about it and try to work it out. As an avid reader who loves to explore words and travel the journey of a book of any genre it is not often I can honestly say I wouldn't bother but sorry Barbara Toner Because I Love You has just been placed on my list of books to be read if one really has nothing better.